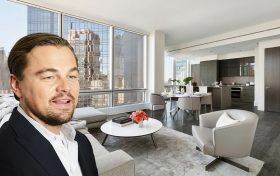 Leonardo DiCaprio has spent the last few months breaking in a newly-minted three-bedroom penthouse apartment at the shiny new development at 172 Madison Avenue, according to the New York Post. He’s starring in Quentin Tarantino’s Charles Manson-themed movie, set to be released in 2019–his first big gig since his Oscar turn in 2015’s “The Revenant.” Leo has been living in a three-bedroom unit in the recently-completed luxury condo “for several months,” a spy says. POLL: Are Private Pools the Next Must-Have Amenity? This morning we revealed renderings of Six Sigma’s upcoming condo at 435 West 19th Street, which offers private pools as one of its amenities (along with a sky garage). We first saw this perk pop up at SCDA’s Soori High Line a few blocks north on 29th Street, where 16 of its 27 units will feature heating swimming pools. Then, a $13 million condo at 172 Madison Avenue touted its 50-foot-long private pool, and One Riverside Park, Extell’s notorious “poor door” building, flaunted its duplex’s private pools. While this may be a new trend here in NYC, “Soo Chan, principal of Singapore-based SCDA Architects, has already made a name for himself in Asia as the pool master, designing towers with up to 120 private swimming holes,” as we previously reported. So now that New Yorkers are getting a taste of what it’s like, are private pools going to be the next incarnation of the can’t-live-without fitness center? Now that $1 million parking spots are the new norm and luxury apartment buildings are all but expected to offer outrageous amenities like vitamin C-infused showers, pet spas, and bowling alleys, developers have to get creative with their over-the-top offerings. So, how about a private swimming pool one-third the length of an Olympic pool? 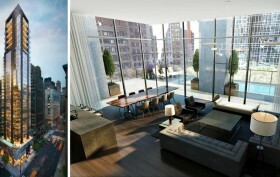 According to the Daily News, that’s exactly what’s up for grabs at newcomer 172 Madison Avenue. “It’s the Pacific Ocean compared to the wading pools in even the fanciest new condo buildings,” says the paper, and that’s certainly true considering it will be 50 feet long.